Hai Hai Hai! This post is about the first pants I ever made for MYSELF. Up until a couple of months ago, I did garment sewing for everyone but myself. People have received lounge pants and joggers from me, even skirts. But for me? NADA. So I decided to be a little selfish and make me a pair of joggers. **Picture from TrueBias website. Click on the image to go to their website. I purchased the Hudson Pants patterns a year ago because one of my friends wanted me to make them a pair of lounge pants. I searched online for patterns and the Hudson pants were the talk of (sewing) town. So I had to jump on that wagon and give this a try. I still remember being so scared because it was really the first time I was making an adult garment. I've been sewing baby joggers for a couple of years now, but adult joggers are a bit more complicated. Followed all the steps and finished with something that did look like a pair of pants. So off they went to the friend. She tried it on, and hmm... let's say - I wish I had made them a big larger. But overall, I think they were ok? I haven't heard much feedback so my guess is that they are not getting worn much. Fast forward one year later, and here I am - staring at the Hudson Pants pattern and thinking - am I really capable of making an adult garment and make it look good? Surely it will be more easy because I can test it out during the sewing process. I already have this pattern. Googled the Hudson pants and there are so many cute versions. I only have 1 pair of lounge pants from Lululemon and the beau says he doesn't like them because they are too baggy (even though he was the one who bought it for me as a gift). I promised myself that I'll make the garment for myself for any adult pattern I have purchased. Hudson Pants Pattern - I printed at home and taped all of the pieces together. I measured myself and determined I was a size 14. Main Fabric - Camouflage print french terry fabric I bought a long time ago at Fabric Outlet SF thinking one day I'll use them for a pair of lounge pants (hurray!). Waistband and cuffs fabric - black cotton knit (95% cotton and 5% spandex). Used the same for the pocket details. Waistband - 2" elastic + black drawstring. Knit Sewing Basics - sewing machine, thread, scissors, seam ripper, etc... Also, use a Jersey Needle. I have learned that there are different types of needles and for knits, you need to use a jersey needle (also called ballpoint needle) because it is rounded and doesn't destroy the knit when sewing. The Good: I totally forgot how easy it was to follow the instructions for this pattern. 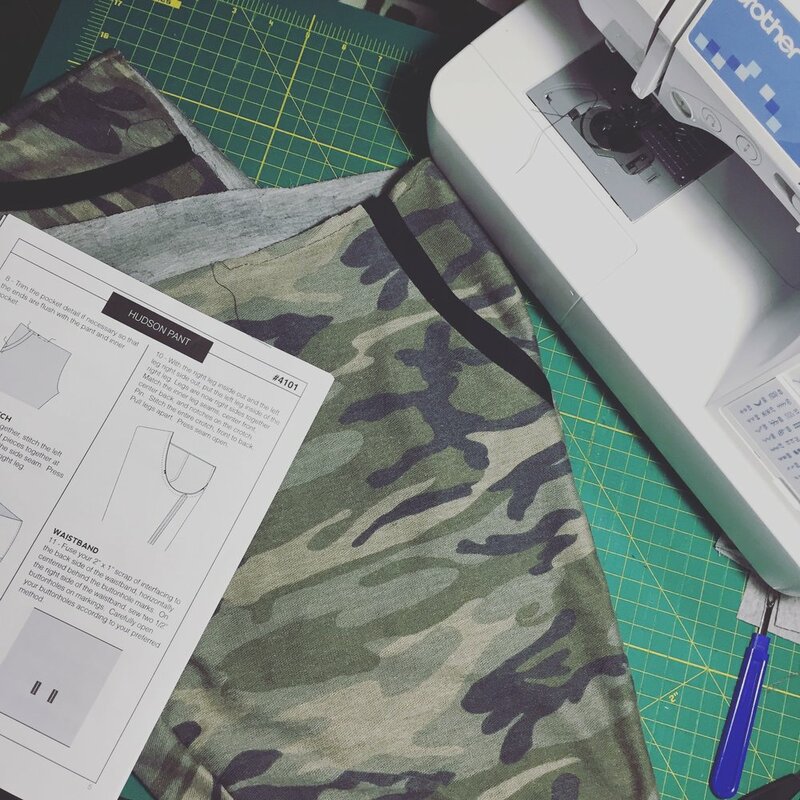 I don't have much experience sewing pockets to pants, but the instructions were so easy to follow that I didn't even make one single mistake! And that says a lot - my beau is mesmerized how I have been sewing for 2+ years and I seem to still find myself cursing at the machine every single time I sew (HA!). Also, everyone that has seen the pants has commented about how the pocket details is great! I bet they think it was probably something super hard to make, only if they read the instructions - they'd be like... meh, not a big deal - seems like a breeze. The Bad: Sizing was a bit tricky. This was probably my bad, the pattern refers to 3/8" seam allowance, but the lazy me decided to sew everything with a 1/4" seam allowance because I just used the overlock stitch from the sewing machine and it the stitch doesn't go any larger than 1/4". This is the same I use for the kid joggers I make, so I thought it'd be ok. Good thing I tried them on before I sewed the waistband and oh lordie was it LARGE! I was swimming in it, it was like I was wearing clown pants. And the crotch area, I had so much material leftover, which is weird 'coz I have big bootie and big thighs. Then again, maybe I measured wrong and should have used a size 8 or 10. When I shop for clothes, pants-wise, I'm, usually a size 8. I'll make another pair this time in a smaller size and see how it goes. In any case, yes - it was too large, so I had to use my imagination and make some adjustments here and there, took out about 3"-4" overall width and took in about 1" in the crotch area. The way I did the crotch area meant that the crotch area has a little drop, which actually I ended up liking quite a bit. And here it is, I really like these pants because I can wear them long or lift them up for a gangsta style. I swear I wear these on a weekly basis! Seriously, need to make me a couple more!